The earliest info we have on Android 5.0 Lollipop's distribution is that it's cure present on merely 0.5% of all Android devices. On the contrary, Android 4.4 KitKat, the erstwhile star of the show, has been basking in a lot of popularity and has finally surpassed the previous Android versions in terms of adoption rates. But have you wondered how Android has evolved over the years? If so, rejoice, as we have some nice graphics in store for you. Created by Davide Coppola, an analyst, the graphs show us the ups and downs of the more recent Android distributions, such as Gingerbread, Jelly Bean, and, of course, KitKat. What's noteworthy in this piece of data is that it showcases the rise and the fall of each Android version, which ultimately reveals some curious trends. For example, Android 4.2 Jelly Bean has been experiencing a slow, yet steady growth up until recently, when its overall usage has begun to decrease. 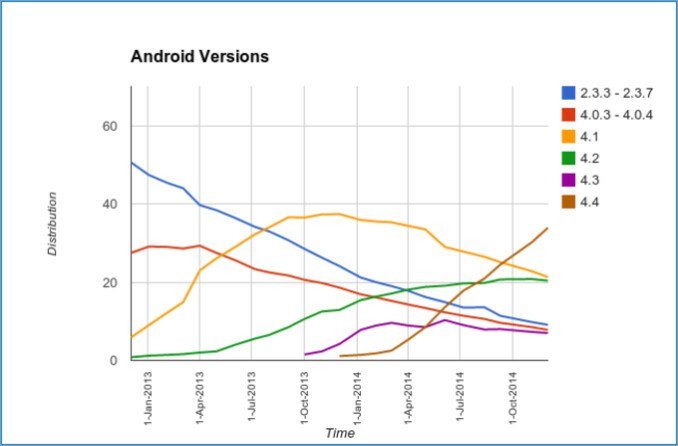 At the same time, the usage of Android 4.1 has been (unsurprisingly) quickly tumbling down for the past year so. According to Mr. Coppola, both of the latter are powering 20%-25% of all Android devices at the moment. KitKat has not taken a break yet; on the contrary, it has almost doubled its market share during the past few months. In the beginning of July, its adoption rate stood below 20%, while it's currently running on slightly less than 40% of all 'Droid devices on a global scale. A big question remains at hand, though - is Android 5.0 Lollipop present on more devices than Android 1.5 Cupcake? There's still more Gingerbread devices than ICS? That's a bit depressing. Well lots of manufacturers skipped ICS because of the slowness. Samsung diddn't update phones except S2 and Note to ICS. Why? That's mean Gingerbread still good enough to compete against other phone in 2014. That's IMPRESSIVE!!! Actually, no, it isn't power efficient like JB, and lots of apps doesn't support phones under ICS. So you can't have chrome, or google keep, or something like that. That pie chart GIF is pretty cool. I'm on gingerbread 2.3.6 and all of my apps are running with no issues. Still using 4.3 on my Mate2...doesn't bother me a bit, runs like a CHAMP!